That’s why when reports emerged last November that the scientist He Jiankui of the Southern University of Science and Technology in Shenzhen, China, had used CRISPR to alter the DNA of twin baby girls — crossing a line that genetic engineers had respected for decades and reaffirmed in 2015 — Doudna was quick to speak out. Describing herself to the media as “horrified and stunned,” she criticized his actions as risky, premature and unnecessary, given the absence of pressing medical need for the children to be modified experimentally. She encouraged the international scientific community to develop better guidelines for permissible genome editing in humans. 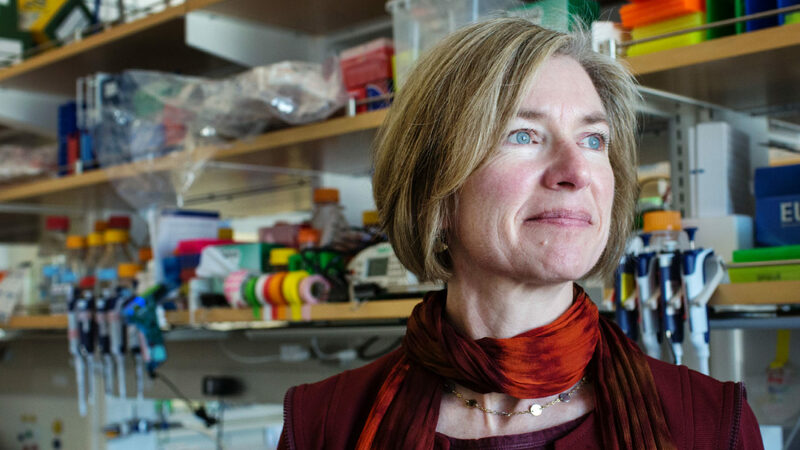 Quanta Magazine sat down with Doudna, a professor of chemistry and molecular and cell biology at the University of California, Berkeley, to discuss how CRISPR is furthering basic biology research. That interview and subsequent exchanges have been condensed and edited for clarity. When CRISPR is discussed in the public, it’s often in regard to how it will be used to cure and treat disease. How do you think CRISPR has and will further basic biology research? I’ll give you two examples that I think are fun because they illustrate some of the creative things people are doing now that weren’t possible in the past. One of them is a project to investigate the origins of bipedalism. This project involves comparing the genetics of two types of rodents — a standard quadruped mouse and a rodent called a jerboa that hops on its hind legs, so it’s bipedal. What if I start putting genes from the bipedal rodent into the other rodent? Can I eventually make a bipedal field mouse? This is the kind of project that’s possible now with CRISPR. The other CRISPR experiment I want to highlight explores the content of the Neanderthal genome. A lot of us now know that we have a little bit of Neanderthal DNA in our background, but what were the real differences between modern humans and Neanderthals? Why did Neanderthals go extinct, and what can that tell us about our own evolution? 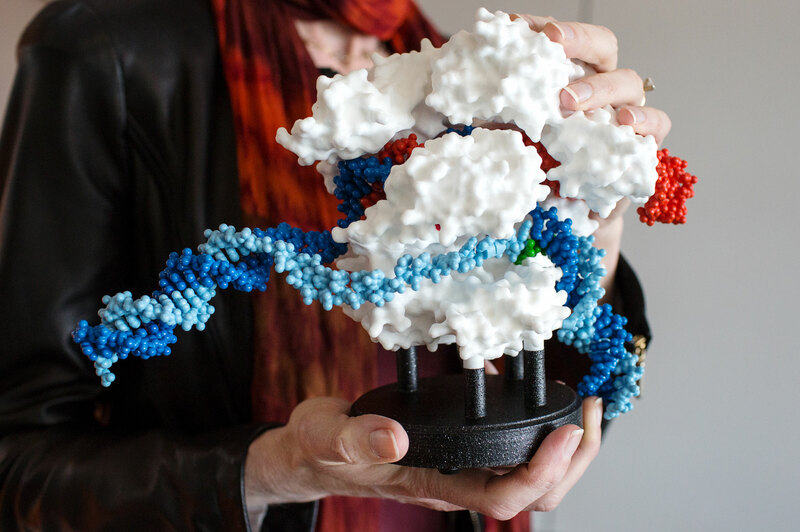 Doudna holds a model of a CRISPR-Cas9 complex beginning to edit a stretch of DNA (blue). 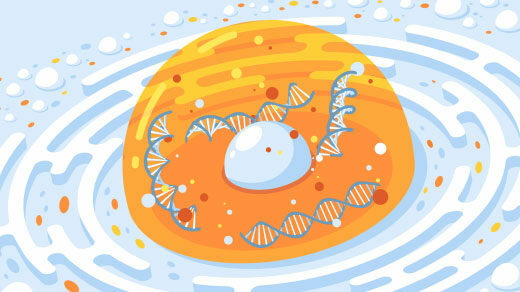 The CRISPR’s guide RNA (orange) binds to the defined DNA target; the Cas9 enzyme (white) cuts the DNA. How do you explore that? An experiment that’s now underway is taking genes from the Neanderthal genome and putting them into human cells that are cultured in the lab in the form of brain organoids. Organoids are balls of tissue that form organlike structures in a laboratory dish. I don’t want to say they’re like little brains, but these organoids have some properties of collections of neurons found in the brain. The question then is to ask, if you start introducing Neanderthal specific genes into these human brain organoids, what happens? What kinds of changes do we see physiologically in those cells and in those balls of tissue? Can we learn something about the genetics of neuronal development in Neanderthals that might be different from what happens in humans? It’s the early days of this research, and an organoid is not the same thing as a brain, so there’s going to have to be some interpretations of what the data mean, but I think that’s the kind of experiment that couldn’t have been done before. For the most part, we didn’t have a way to introduce changes to genomes precisely. The way that gene therapy was done originally was using viruses that integrate into human DNA, but the viruses integrate where they want to go, not necessarily where you want to make a change to the DNA. Earlier technologies for gene editing were also very difficult to use in many settings. They required a lot of legwork to develop, like engineering particular proteins for each desired change to a genome. Certainly, it was difficult with those technologies to make more than one change at a time. With CRISPR, experimenters can change multiple genes in a genome in one shot. Do you think that the medical applications of CRISPR in themselves can inform basic science? For sure. CRISPR technology has been widely adopted by all kinds of scientists, including people like me. I was never doing anything with genome editing before CRISPR came along. In my lab we’ve had a project over the last few years working on Huntington’s chorea, a degenerative neurological disease. The mutation that causes the disease is a single codon — three base pairs in the DNA — that gets repeated many times. If the codon gets repeated too many times, it leads to a defective protein that causes this disease. That’s been known for a long time, but the challenge was, how do you fix it? We’ve been working on a way to deliver the CRISPR into mouse neuronal cells to make the necessary edits. But one of the curious things that’s come out of that line of work is that we found that only neuronal cells in the mouse brain were getting edited, not [the supportive glial] cells called astrocytes. These cells are a lot smaller, so it could be that they don’t have enough surface area to take up the CRISPR protein efficiently. Or maybe they don’t respond to DNA cutting and editing in the same way as other cells. 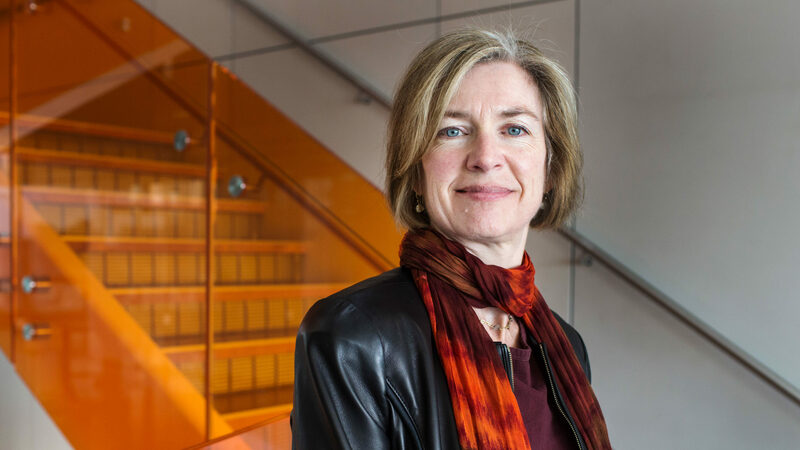 Video: Jennifer Doudna, one of the coinventors of CRISPR technology, discusses how her work on bacterial defenses against viruses helped lead to a discovery with a revolutionary impact on biological research. So not all the cells in the brain respond to the CRISPR treatment the same way. We also found that, when we inject CRISPR molecules into one place in the mouse brain, we see cells that are a fair distance away from the injection site also get edited. That was a surprise because it suggests there’s some way of trafficking molecules through the brain to areas that are not right next door to where the needle goes in. Is there some mechanism for molecular trafficking in the brain that hasn’t been appreciated? That’s a very fundamental question in biology. That takes us back to asking, “Gee, how does the brain work?” Now we’re exploring answers to these questions. I have to say that this example from my lab is emblematic of what’s going on in a variety of labs. CRISPR enables very applied experiments, but these experiments raise very fundamental questions that you have to go back and address. How pervasive do you think the use of CRISPR will become in biology? It already seems to be everywhere in biomedical labs. Do you think there might be applications in fields like ecology, for example? Absolutely. It depends on your definition of ecology, but some of the early adopters of the CRISPR technology were people who were trying to understand the genetics of butterfly development. Having a tool that allowed the manipulation of genes in non-model organisms — organisms that scientists haven’t been working on for decades in the laboratory but instead collected in the wild — opens up the possibility of real experimentation in a way that previously was not possible. Effectively any organism becomes a model organism — a genetically tractable system for doing experiments. We joke in the lab that we’re turning humans into yeast: In the past, you had to do experiments in yeast or fruit flies and then infer what those data meant about human cells. You couldn’t easily manipulate human cells genetically to understand genetic function. Now, with CRISPR, you can. CRISPR was first discovered as a defense mechanism that bacteria use against viruses. Do you think other new research tools might come from other discoveries about bacteria? I suspect so. If you look at the technologies that have come along over the last several decades — polymerase chain reaction for amplifying DNA, molecular cloning — they all came about from studying how microbes fight off viruses or respond to stimuli. We also know very little about the bacterial world right now. There’s a huge number of organisms that have never been identified by scientists or cultivated in the laboratory, and they surely have interesting biology associated with their lifestyles. As more of those organisms are studied and identified, I have no doubt that we’ll find things that will lend themselves to new technologies. 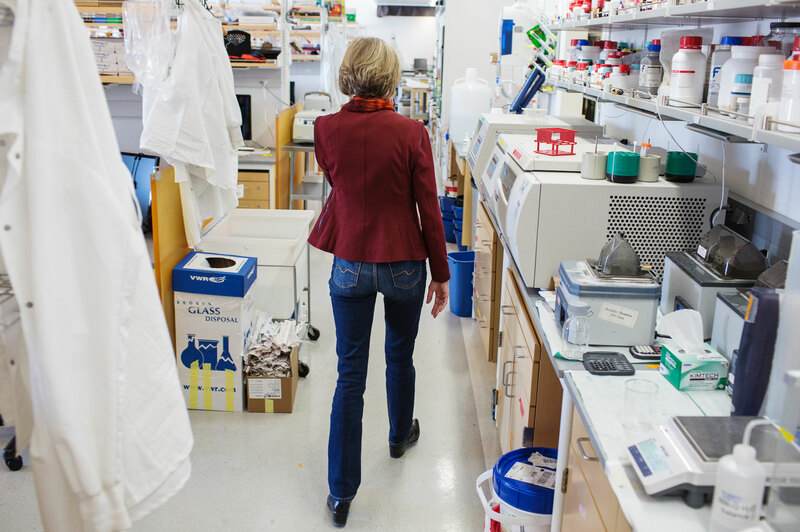 Doudna walks through her lab in the Energy Biosciences building on the Berkeley campus. Are there any particular enigmas in bacteria that you have a hunch might lead to some sort of research tool? That’s always hard to predict. That being said, I’ll give you an example of an interesting phenomenon: the discovery of this new category of bacteria that are incredibly small. It’s a whole new phylum of organisms — they’re currently called the candidate phyla radiation (CPR) bacteria. They almost challenge the notion of what’s a cell and what’s a virus. A lot of these organisms probably grow symbiotically with other bugs, sharing important molecules, maybe even the building blocks of DNA, RNA and proteins. But how do they import molecules? How do they control their environment so that other kinds of bacteria don’t overgrow and crowd them out? These are all unanswered questions. We don’t understand anything about their fundamental biology in a molecular sense. Will answers to these questions lead to a new technology? I don’t know, but it’s certainly going to lead to interesting biology. So, the place to look for new research tools might be organisms that are atypical, so to speak? These tiny CPR bacteria are the ones in which you and Jillian Banfield of the University of California, Berkeley recently found new Cas enzymes [for cutting strands of DNA] that could be used with CRISPR technology, aren’t they? What makes those Cas enzymes potentially so interesting and useful? One of the new enzymes we identified is called “CasX.” It’s particularly interesting because it seems to work quite differently from its cousin Cas9, the enzyme that many conventional bacteria use in their CRISPR defenses and that’s commonly used in CRISPR technology. But a few core ingredients are the same. This gives us insight into the basic recipe for CRISPR cutting proteins. The more we understand these proteins, the better we can engineer them. CasX is also appealing because it’s much smaller than Cas9, which might make it easier to slip into cells for therapeutic genome editing. There have also been other new spinoff technologies developing out of CRISPR-Cas9, like CRISPR-GO, DNA imaging and anti-CRISPR. How might they help basic biology? So let’s just go through those. CRISPR-GO is this clever way of using CRISPR enzymes to bring particular parts of the genome into physical proximity. There’s evidence that when genes are being expressed together in cells, they’re often brought together physically to the same location in the cells, and that can fundamentally affect the levels of proteins that are produced from certain genes. What CRISPR-GO does is provide a technology for doing that kind of physical tethering, except now the scientists can control it rather than the cell controlling it. I think that creates an opportunity to start dissecting the relationship between the 3D architecture of the genome and the communication between genes, and the resulting levels of proteins or RNA molecules that are made from those genes. So that’s exciting. It’s something that, again, really hasn’t been possible before, to control the 3D architecture of chromosomes and ask how that affects the output from the genome. You mentioned DNA imaging. The idea there is what’s being referred to as “chromosome painting,” where you can program the CRISPR-Cas9 protein to bind and basically sit for extended periods of time at certain places in the DNA. You can decorate the CRISPR-Cas9 protein with different colors of dyes to light up a particular gene or section of a genome, even an entire chromosome, by just tiling it with these little RNA-protein complexes. So it’s a method for imaging. In the case of anti-CRISPR, these are teeny tiny natural proteins involved in regulating CRISPR systems. You can imagine that in bacteria that are getting infected by viruses, over time viruses have evolved ways of avoiding being taken out by CRISPRs, and one of the ways they do that is using these little inhibitors called anti-CRISPRs. There’s interest in these because of the potential to control gene-editing outcomes — using these kinds of proteins to turn off gene-editing proteins in cells to protect the genome from being modified in unintended ways. There’s a whole line of research now that’s taken off to look at natural regulators and inhibitors of CRISPR pathways and ask whether those can be harnessed for technology purposes. Could the development of anti-CRISPR quell fears about genome editing in humans or other organisms, if we had an off switch to throw if CRISPR-Cas9 wasn’t working as intended? That’s exactly what people are thinking about. In fact, there’s a whole program funded by DARPA (the U.S. Defense Advanced Research Projects Agency), that has the title “Safe Genes,” that’s about safe ways of manipulating genes and genomes. And one of the strategies that groups are using to do that is using these anti-CRISPRs. Do you think that CRISPR helps us get closer to understanding how all the pieces in cells are working together rather than just separately? I think it will increasingly play that kind of a role in the future. Let’s go back to neuroscience, because there’s a case where CRISPR has come to the fore in studies of the development of the brain. Researchers haven’t been able to figure out how many different types of cells are in the brain. We also don’t know how the brain develops in the sense of its 3D architecture. If you start with a stem cell or a few stem cells, how does that develop into an entire brain, and what’s the map of the brain? There’s a lot of interest right now in using CRISPR to do what’s called lineage mapping. If you have a population of cells that develop from a single cell or a small collection of cells, you can track how cells from that starting population give rise to their progeny by introducing a little edit to their DNA to mark them. Several research teams are using CRISPR this way to figure out where these daughter cells end up in the brain and even what kinds of cells they become. I think these kinds of experiments will lead to a more fundamental understanding of tissue development — in particular, in the brain — that hasn’t been possible before. I’ll give you another example. There are interesting cases — and we’re finding more and more of these as people get their DNA sequenced — of families in which everybody has a certain allele, a certain DNA sequence of a gene, but only some of them have a disease that’s associated with that allele. The others don’t. So you know that there’s something in the DNA of the people who are unaffected that suppresses a negative impact of that gene and makes them not susceptible to cancer or whatever other disease they would otherwise succumb to. What are those suppressors? I think understanding those kinds of genetic interactions is going to be incredibly powerful going forward. Up until now, we haven’t really had a way to do it because, first of all, people weren’t widely going around sequencing their genomes. That’s starting to happen more and more, with companies that offer this and the cost coming down. Then there’s also having a technology that allows genetic manipulation of patient-derived cells. So if you have somebody that comes into a clinic and they have a disease that gets diagnosed, you can take cells from that person and you can cultivate them in the lab. That’s been possible for a while, but what wasn’t possible previously was to do genetics on those cells. Now we can, in living cells that relate to an actual patient. That sounds like an unexpected benefit of the sequencing technology. I think it’s important for people to appreciate that this is how a lot of science happens.